At Crowsnest Coffee Company, when we are not slaving over a hot roaster we like to be outside. We really like coffee, and we really like bikes, and all sorts of outdoor activities. These shared passions lead to the inevitable and natural decision to have our beans in bike shops and to support local sporting activities. Check out the following shops and races, you can drool over gear, drool over coffee, and if racing, drool on yourself. The Sinister 7 Ultra + Relay, a race that may be greatest challenge of your life. The 148km course will take you through the most rugged, remote and beautiful terrain in Alberta's stunning Rocky Mountains. With over 5,250m of elevation gain across the course, this race will punish those who are not prepared. The Sinister 7 is open to solo runners or teams of up to seven and racers have 27 hours to complete the grueling event. The course is split into seven stages, each featuring a geographic and historic highlight of the Crowsnest Pass. The race's name is inspired by the treacherous Seven Sisters Mountain that looms over much of the course. Crowsnest Coffee Company is proud to be a sponsor of this awesome club! Odds are if you are at any cycling event, you will see a Deadgoat member. They are fast, dedicated, and love coffee, our kinda people! The Deadgoat riding club and race team is a Calgary, Alberta based cycling club and race team which was founded in 1995 by Pat Doyle and Tim Brezsnyak. 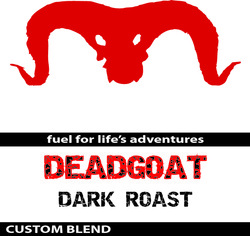 The name came from the long since defunct Deadgoat Saloon in Salt Lake City, Utah.